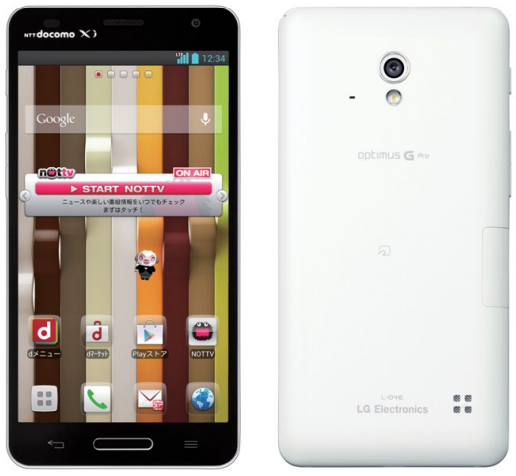 Last night, Japanese Android lovers were officially introduced to LG’s new Optimus G Pro. We have seen leaks of the device here and there, but this time, it’s real. Heading through carrier NTT Docomo, the G Pro features some very nice specs such as its 5″ 1080p display, a 1.7GHz Snapdragon S4 Pro processor, 2GB of RAM, a monster 3,000mAh battery, and 13MP back-facing shooter. According to Docomo, the device will arrive on their shores sometime in April, but there is no word from LG as to when the rest of us can see it. It will be on hand at MWC next month, so there are bound to be plenty of nice hands-on videos showing up in the coming weeks. If the device found its way to an American carrier, would it be on your list of potentials?